You may recognize the young lady in the top right of this picture. She is Shaan Hawkins. I introduced you to her courageously successful battle with breast cancer a few weeks ago. Pictured from left to right is Shaan's aunt Susan Padgett, her grandmother Eldis Smith, Shaan and Shaan's mom Shena Dodd. 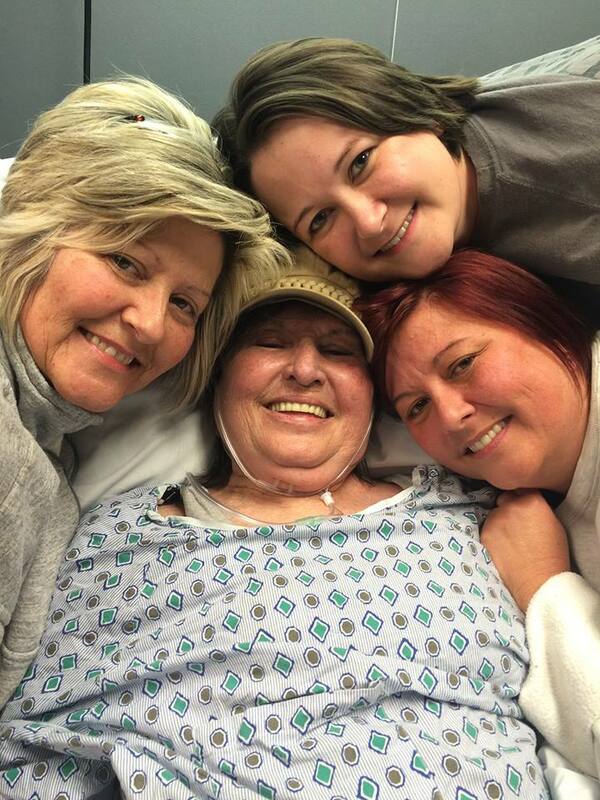 The picture was taken in the hospital shortly after this precious Grandmother was diagnosed with bone cancer. Eldis elected to forego treatment. She was released this past Monday with Hospice care in her home. Eldis is no ordinary woman. She's a mom, grandmother, friend, sister, wife, encourager, songwriter, piano player, drama director, fun-loving gift from God. She survived a double mastectomy from breast cancer, surgery for a brain aneurysm, widowed after 50+ years, raised seven kids (three of them adopted) and I won't attempt the number of grandchildren and great-grandchildren, there are many! In short, there are many, many people who love this lady, including me. She's been one of my spiritual supports for Godly growth and a mentor to me about love; God's love. I've seen her many times like John the Revelator "caught up" in God's love repeating the same phrase over and over "God is love, God is love!" I left the Independent Baptist Church I grew up in after worshipping there with Eldis and her family for 42 years. I joined First Baptist Chatsworth with my family, incidentally or not, the same church where Eldis grew up. I am thankful for my years at Mt. View Baptist. My move left some people scratching their heads wondering why I made such a drastic change from an uber-conservative church to Southern Baptist (also conservative). The answer is simple. Whether it was self-inflicted or a very present demonstration, I grew up with an "unhealthy" fear of God. Watching Eldis, I grew to realize God is not "out to get me" for something I did or didn't do (not going to church on Wednesday night). He gave his only son, Jesus, so I might have life more abundantly. If I accept his sacrifice, apply it to my life and live for and through him, he is faithful and just to forgive my sin. Proverbs 9:10 The fear of the Lord is the beginning of wisdom: and the knowledge of the holy is understanding. I've learned fear is respect and acknowledgment, reasoning together, not shrinking in the corner or coming to church because you fear what God will do to you if you don't. I interpret Godly fear similar to the way God wishes us to respect our parents, after all, he is our Father. First Baptist Chatsworth has fostered the Eldis creed in me. When I walk thru the lovingly comfortable double doors I can feel the spirit of a younger Eldis chanting to me "God is love, God is love!" I am forever grateful to this extraordinary woman that held to her belief when others didn't fully understand. The basis of Eldis' faith is Jesus Christ and his love for her, mine is too. We will never outlove him. As I watched this sweet family gathered around her hospital bed, laughing until they lost their breath, I marveled. Their faith impresses, to say the least. I only hope to possess this attitude when it's time to surrender my parents to their Heavenly Father. After a laughing frenzy, when Eldis regained her composure, she looked at me and said, "Tammy, I've always thought that God wants us to run to him happy when it's time instead of him having to drag us by the hair of the head saying (in the gruffest voice she could muster) "I SAID COME ON!"" As always Eldis, I think you're right! ***I had to edit this post to include a fond memory. Eldis was the first and last person to serve me ground beef gravy for breakfast. She subs ground beef for sausage in her gravy. Her family loves it! I had never heard of ground beef gravy let alone tasted it!. Eldis says, "You have to get creative when raising seven kids on a budget!" I didn't like it 35 years ago and still don't but I'm sure it's still a staple at the Smith house! Awesome.. Run to him... a very good way... and she will! So beautiful. And yes, God loves his children so very much. Even those who have strayed. He loves us (mom's children)and had mercy on us enough to allow us to show mom how much we love her and to say our proper good bye. She may stay 3 more weeks, months or years. But which ever the case may be, we've said our good byes and is at peace when she finally decides to leave this world. To witness someone, especially your parent, be excited to Go Home is such a blessing and is a comfort that is beyond understanding. When I prayed to God when Shaan was diagnosed with cancer,I prayed, 'God, I believe you can move mountains". Then God whispered, 'do you know I can move mountains". The sweetest peace fell over me because I KNEW He could move the world if it was in His plan. I don't just "believe" mom will be sitting at His side, I KNOW! And that is the unspeakable peace I have been taught my whole life. I understand it now! Daddy used to sing a song in church, "wonderful peace". Sweet peace coming down from the Father above. I've felt that peace and it is so sweet. This world will be a darker place without mom, but heaven will gain the most perfect angel. Love you Tammy for this article. I wish everyone could have the pleasure of meeting my mom. She's such a blessing and emits LOVE! Shena Dodd, proud daughter of Eldis and proud mom of Shaan. I hope I grow up to be like them one day. Y'all have been blessed with so many things and have witnessed God move many mountains! I can hear your dad singing "wonderful peace". I can hear your mom singing many of the songs she wrote and I agree, I wish everyone could have the pleasure of meeting your mom also! I'm so thankful and in aw of the peace each of you through Jesus. May God continue to bless your family through it all. Love you Shena! Enjoy all your girls! God Bless You All! What a beautiful legacy!! !